With the release of two albums this year, Spirit Moves and A Single Sky, both on Greenleaf Music, Dave Douglas continues to show why he is one of the few musicians who is truly pushing jazz forward with original, innovative and entertaining material. The album that has captured my hears this year is an all brass ensemble recording entitled Spirit Moves. Spirit Moves is fun, complex and refreshing. A real change from Douglas' more bop and electronic hybrid albums of the last few years. Spirit Moves begins with a nod to New Orleans gospel funeral marches with "This Love Affair" and quietly moves through a series of lovely motifs that leave the listener with a sense of joy and enlightenment of what the possibilities are in jazz. At times you never notice that this is a all horn affair excluding the exquisite drumming from Nasheet Waits. No bass. No piano. How can this work? Well my friends its an amazing record that I think everyone would enjoy. There's nothing avant garde about this record. It lays out a path that is straight forward and let's you weave your way through the contributions of each instrument. One of the best parts for me is how Douglas allows instruments like the tuba and trombone to take center stage at certain moments as on the wonderful "Bowie" (a tribute to legendary trumpeter Lester Bowie). This is one of the most enjoyable and upbeat albums of year for me. Some jazz listeners may notice the similarities with the great New Orleans jazz band Dirty Dozen Brass Band, but I would say this is a much more intricate and focused thematic record than what DDBB would do. 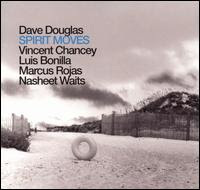 Don't get me wrong, I love DDBB but Dave Douglas is in prime form musically and emotionally on Spirit Moves and I believe this is an album that commands your attention. I think if you haven't listened to Dave Douglas before this might be a good place for you to start and you will be keeping your eyes open for Dave Douglas from now on.